The sweet potato topping makes a nice change and is an interesting flavour contrast with the fish. To make the topping, boil or steam the sweet potatoes until the point of a knife goes in easily. Drain and mash well with the butter and some salt and pepper. To make the fish pie, melt the butter in a saucepan set over a low heat. Add the leek and sauté gently for 2 to 3 minutes, until soft. Stir in the flour and cook for 1 minute. Gradually add the stock, stirring all the time to avoid lumps, then add the milk. Bring to the boil, then reduce to a simmer and cook for 3 to 4 minutes, until thickened. Check the seasoning and add a little salt and pepper if needed. Gently fold in the fish and simmer for 2 to 3 minutes, until the fish just turns opaque. It doesn’t need to be cooked all the way through here, as it will finish cooking in the oven. Stir in the cream, if using. 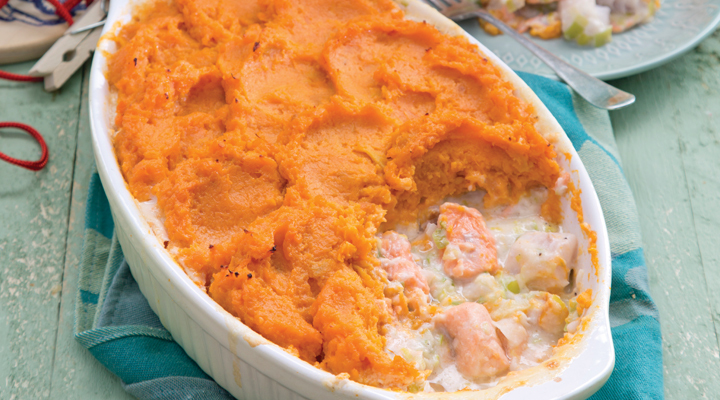 Spoon the fish into an ovenproof gratin dish and top with the mashed sweet potato. Bake in the oven for 20 to 30 minutes, until the filling is bubbling and the topping is golden. Serve straight to the table and let everyone help themselves. If making the fish pie ahead, allow the fish mixture to cool in the gratin dish, then top with the cooled sweet potato mash, cover and refrigerate until needed. Allow an extra 5 to 10 minutes in the oven if cooking straight from the fridge.